March 31, 2018 by J.B. The volunteers set out a forage on the hill this morning. 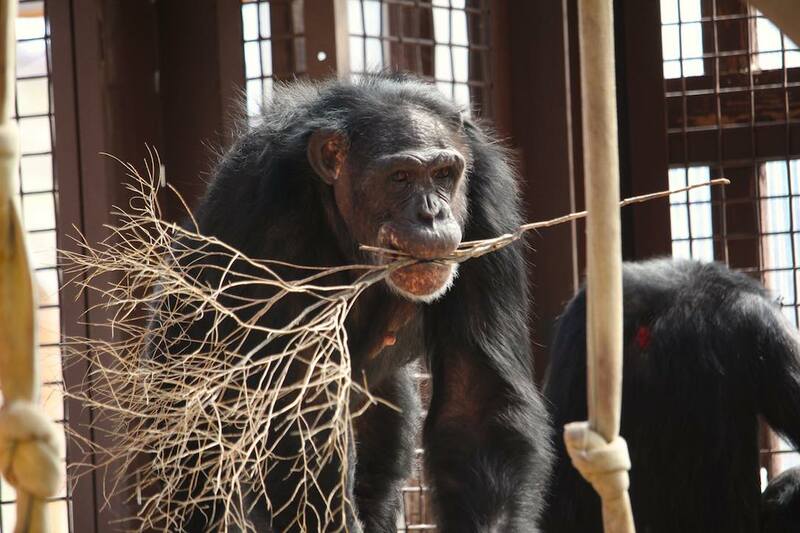 After an initial course of smoothie, vitamins, and peanuts, the chimps went outside to search for pieces of orange, plum, grapefruit, and banana as well as some primate chow. Burrito, confronting the dilemma faced by most male chimpanzees from time immemorial – do I feed myself and otherwise engage in the basic behaviors necessary to sustain life, or I do I follow that girl in estrus wherever she goes? For the most part, he chose the latter (poor Jody), but he did manage to grab a few scraps of food along the way. Though we didn’t fill the termite mound with food this morning, Foxie nevertheless checked its contents using a tool and technique never seen before in any wild population: Strawberry Shortcake dipping. March 30, 2018 by J.B.
Over the years, Jamie has continued to develop the ritual around her walks with staff and volunteers. These days, it goes something like this: First, Jamie selects a boot for the human to wear. Next, they walk around the hill together (on opposite sides of the fence, of course). When the walks are done, they reconvene in the greenhouse area, where Jamie grooms the caregiver and the boot. And finally, later that night, she will ask for the boot back before settling into her nest. In anticipation of the grooming part of the ritual, Jamie will often grab a suitable tool during the walk and bring it back with her into the greenhouse. Today, Jamie grabbed a large tumbleweed that had blown against the fence and later used it to groom volunteer Patti and her boots. Spring has sprung and there is nothing but happy chimps here at Chimpanzee Sanctuary Northwest! We had chimps (Negra and friends) baking at the top of the platform in the Greenhouse, Missy asking for the barn doors to be open, Foxie playing wild games of chase, Jamie walking on the Hill & enjoying lots of grooming sessions with her boots, Burrito and Jody hanging out & grooming all day, and Missy and Annie chasing all over the place. Foxie was nice enough to let me get another photo shoot in and Jamie also let me get a few snaps before we started a game of chase this morning!